Fiber optic cabling carries both light data and special considerations for safety. Whether you are installing the fiber optic cabling or simply working near it, you need to be cognizant of special safety protocols versus working with other types of lines. Electricity must always be respected, even when the data being transmitted is in the form of seemingly harmless white light. In some applications, such as in the medical field and in machining, fiber optics are used to cut and cauterize flesh or to remove certain types of materials. As explained by the Fiber Optic Association, there is a distinct difference between the types of light emitted by these types of fiber optic installations versus that of general data-carrying fiber optics. For general duty applications, a long wavelength visible light signal emits through the fiber optic cable that your eye cannot focus on. However, certain other applications can focus a very tight and extremely powerful laser-focused light that can cause damage to your tissues. This type of fiber optic installation can even cause blindness if the laser light enters your eyes. In cases such as inexpensive microscopes that may lack infrared filtration, invisible light from equipment can be damaging to the eyes. Fiber optic wiring tends to operate within different frequency ranges, with the 10 nm range being among the most powerful and physically damaging. As the range expands, such as into the 1300 nm range, it becomes far safer. Testing the power level that is actually being emitted by a given installation is safer than relying on any documentation or signage supplied. One way to test a fiber optic installation is with a fiber optic power meter. With a properly calibrated meter, the power levels can be accurately measured and you can ensure that the power is not sufficient to cause damage to your eyes. Prior to using any device near your eyes, testing is a valuable safety precaution. Unfortunately, a power meter may not always be available. Another type of safe method of testing fiber optic cable installations involves testing them using an older cell phone camera. The cameras that were included in older cell phones were often sensitive to infrared light, which the human eye cannot detect but that can cause damage. All you have to do is take a picture of what is coming out of the fiber optic cable to be certain whether there is excessive infrared light coming from it, which is often in the 850 to 1300 um range. Fiber optic wires are far different from traditional wires, which are normally made out of copper or another type of metal. While even metals that are not magnetic enough for most magnetic fields to affect them may be detectable in such a way, they are at least opaque enough to be seen with the naked eye if one has keen vision. Fiber optic cables, however, are made out of glass that becomes all but invisible in small amounts. Due to the glass nature of fiber optic cables, they become extremely sharp when small shards break off from the main wire. This often happens at a break or a terminal point. It is crucial when working with fiber optic wiring that you always wear safety glasses with side panels, to avoid potential damage to your eyes. It is extremely difficult to see and remove fiber optic shards from your eye if they become embedded, and the potential for irritation and infection is exceedingly high. Keep in mind that in a manner similar to insulation, these shards can also embed themselves into skin and clothing. In your skin, there is a reasonable chance of infection if a shard embeds itself. Your clothing may also carry shards of fiber optic cable to other locations, where it can harm you or others. Careful PPE usage and removal is essential to remaining safe. It could be all too easy to transfer shards onto your skin or, even worse, digest some. Electrical arcs are typically used to splice fiber optic cabling together during installation or repair. These arcs carry the typical dangers associated with any electricity, and safety procedures should be followed at all times. Working with fiber optics can be dangerous if done improperly. 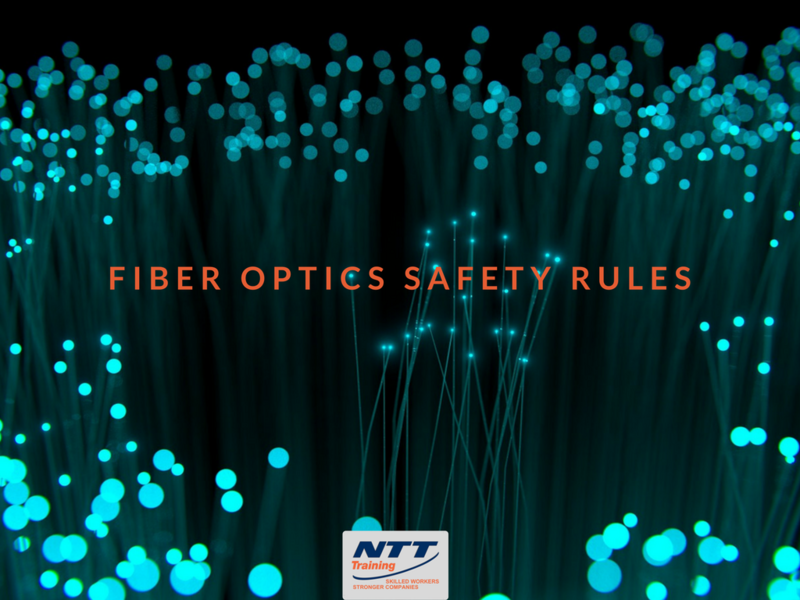 If you or your employees require training for legal or general safety reasons, you would be wise to consider NTT’s line of seminars on Fiber Optic Training. NTT Training, Inc. is nationally accredited by the Accrediting Council for Continuing Education & Training, or ACCET. This accreditation serves to ensure that high standards are met and kept by third parties in government and the private sector. ACCET training practices represent sound education and keep you and your employees safe while working with potential workplace dangers, in addition to minimizing those dangers. Contact NTT for more information.